This is a "full" serial port that can be electronically programmed to work in RS232, RS422, or RS485 mode. The Tibbit is based on the Sipex SP337 universal transceiver. When unconnected, FD/-HD defaults to HIGH, while -232/422-485 defaults to LOW. This means that the RS232 mode will be selected. 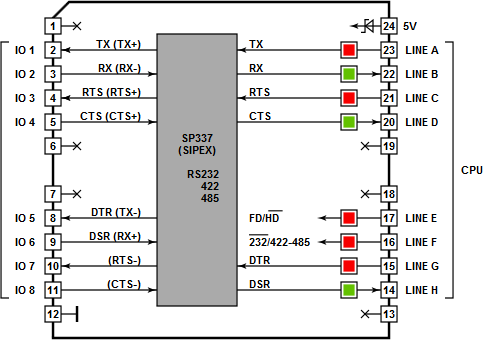 In the RS232 mode the port has RX, TX, RTS, CTS, DTR, and DSR signals. This is the full-duplex mode. In the RS422 mode the port has +/-RX, +/-TX, +/-RTS, and +/-CTS signal pairs. This is the full-duplex mode. In the RS485 mode the port has only +/-RX and +/-TX signal pairs. This is the half-duplex mode, so you can connect +RX to +TX, and -RX to -TX. This will allow your system to communicate over a single twisted pair. Direction control is through the RTS line -- the line shall be LOW for data input and HIGH for output. 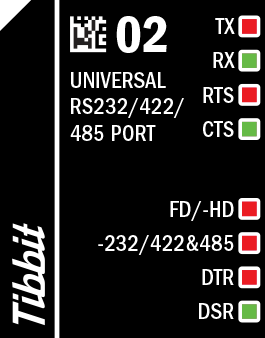 For "normal" RS232/422/485 applications, this Tibbit has to be connected to the TX and RX lines of the CPU's UART (see [SER]). Planning to use RTS/CTS flow control as well? An interrupt line must be available, too (see [INT]). The above pin assignment is the same we use on all our devices with the universal port (for example, see the serial port of the DS1102). You can also combine the RS232 Tibbit with #20 (9 terminal blocks). There are eight LEDs: five red and three green. Red LEDs are connected to TX, RTS, DTR, FD/-HD, and -232/422-485 lines. Green ones are for RX, CTS, and DSR. All LEDs are buffered (with logic gates) and light up for the LOW state of control lines.